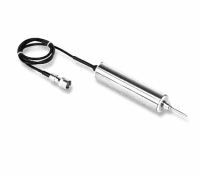 The PSe series,DC/DC LVDT is designed with a return spring, can to measure touching, without fixing of the core connecting rod. They can be used to measure: displacement and change of dimensions or deflections of heavy, giant constructions, wide changes of dilatation slits and a settlement irregularity of concrete blocks in hydroelectric plants. PRINCIPLE OF OPERATION The LVDT is a cylindrical electromechanical device consisting of one primary winding, two secondary windings and a moveable core. When the primary is powered and the core moved, the output from the secondaries is proportional to and in phase with the core movement.The return spring tightens the core connecting rod to the measured object. In the same housing is an electronic system converting the voltage signal from the differential transformer to the standard dcurrent signal in a 3 wire system connection.